Daniel Edward Hinshaw1,2,3,4,5,6 [Ed Hinshaw7]. 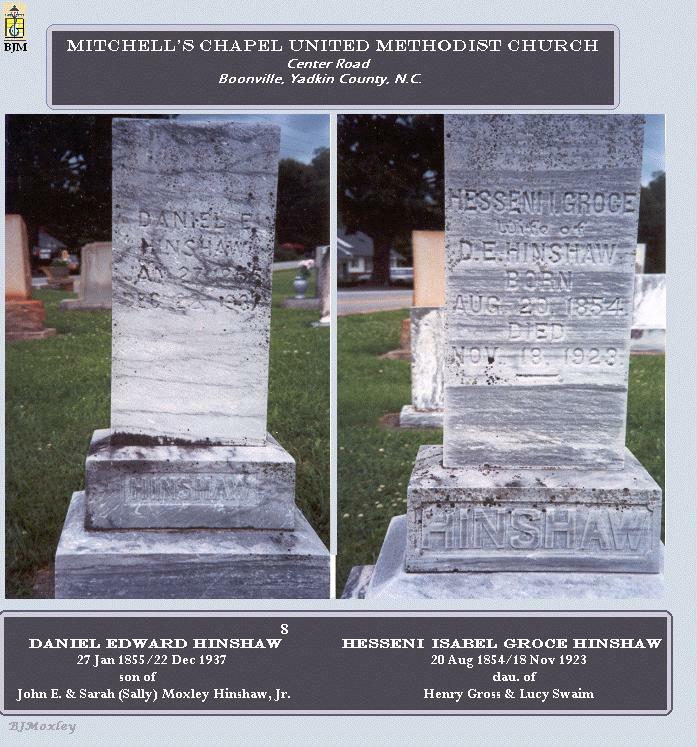 Hinshaw, Daniel E, head-of-household, age 45, born Jan 1855 in North Carolina; parents born in North Carolina; married 22 years; occupation: farming; owned farm (mortgaged). Hinshaw, Hesseenia I. 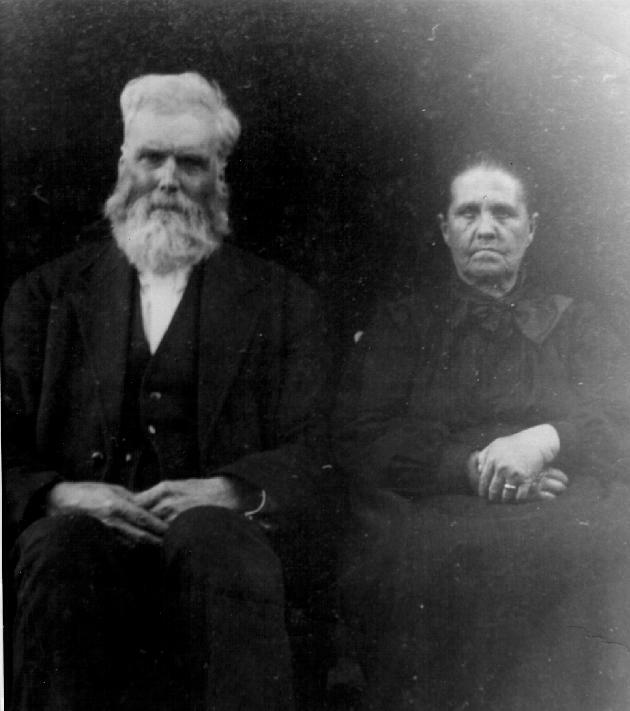 [unclear], wife, age 45, born Aug 1854 in North Carolina; parents born in North Carolina; married 22 years; 5 children, 4 living; cannot write. Hinshaw, Franklin S., son, age 16, born Dec 1883 in North Carolina; parents born in North Carolina; occupation: farm laborer; attended school 2 months. Hinshaw, Carrah L., daughter, age 13, born Sept 1886 in North Carolina; parents born in North Carolina; cannot read or write. 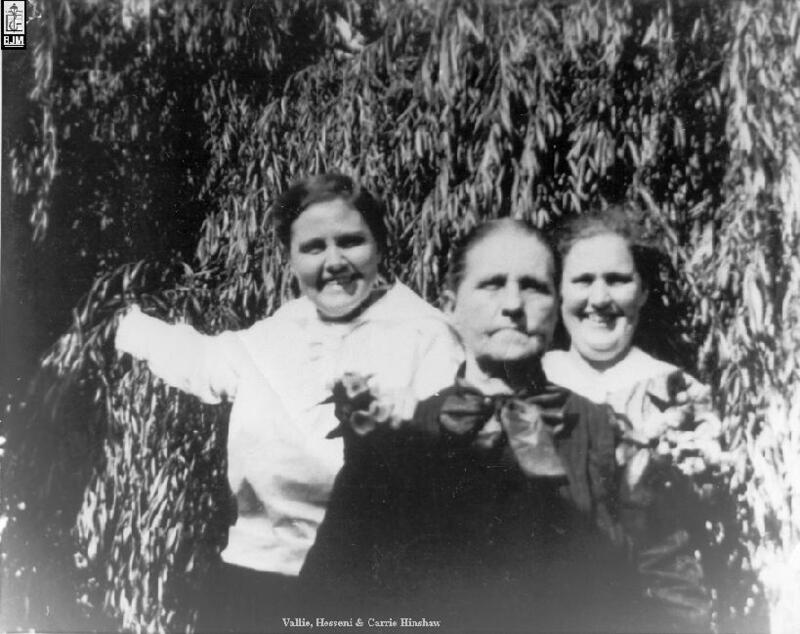 Hinshaw, Vallia V., daughter, age 10, born May 1890 in North Carolina; parents born in North Carolina; cannot read or write. Hinshaw, Mary M., daughter, age 7, born Jan 1893 in North Carolina; parents born in North Carolina; cannot read or write. The enumerator recorded on the above 1900 census page was cousin James Henry Asbury Hinshaw. Hinshaw, Daniel E, head-of-household, age 55, born in North Carolina; parents born in North Carolina; first marriage, married 32 years; occupation: farmer, general farm; owned farm (free). Hinshaw, Senia I., wife, age 55, born in North Carolina; parents born in North Carolina; first marriage, married 32 years; 5 children, 4 living; occupation: farm laborer, home farm. Hinshaw, Carrie L., daughter, age 23, born in North Carolina; parents born in North Carolina; occupation: farm laborer, home farm. Hinshaw, Vallie V., daughter, age 19, born in North Carolina; parents born in North Carolina; occupation: farm laborer, home farm; attended school. Hinshaw, Nancy M., daughter, age 17, born in North Carolina; parents born in North Carolina; occupation: farm laborer, home farm; attended school. Hinshaw, Danel E, head-of-household, age 65, born in North Carolina; parents born in North Carolina; owned home; occupation: farming. Hinshaw, Senie [or Cenie - unclear] J., wife, age 66, born in North Carolina; parents born in North Carolina; occupation: house keeper. Hinshaw, Kerrie L., daughter, age 35, born in North Carolina; parents born in North Carolina; single; occupation: none. Hinshaw, Vallie V., daughter, age 32, born in North Carolina; parents born in North Carolina; single; occupation: none. Hinshaw, Daniel E., head-of-household, age 75, born in North Carolina; parents born in North Carolina; widower; owned home; farmer. Hinshaw, Carrie L., daughter, age 44, born in North Carolina; parents born in North Carolina; single. Hinshaw, Vallie V., daughter, age 40, born in North Carolina; parents born in North Carolina; single. 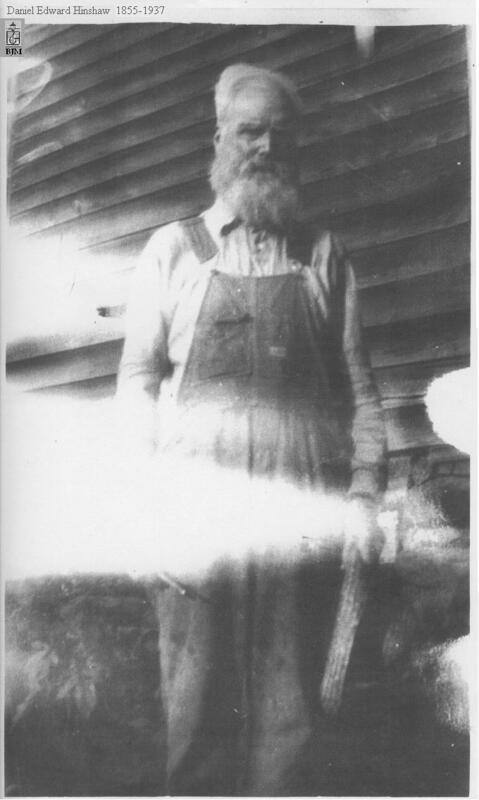 Frazier, Dean, boarder, age 31, born in North Carolina; parents born in North Carolina; single; farm laborer. 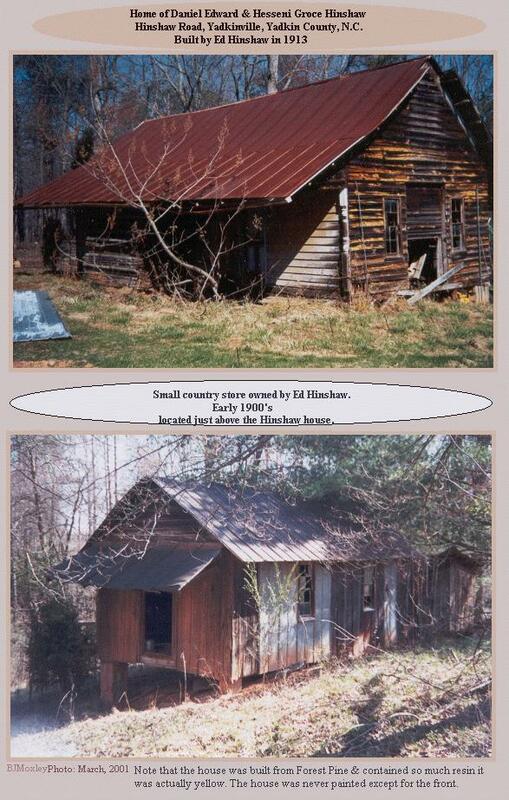 "The Heritage of Yadkin County", 1981. 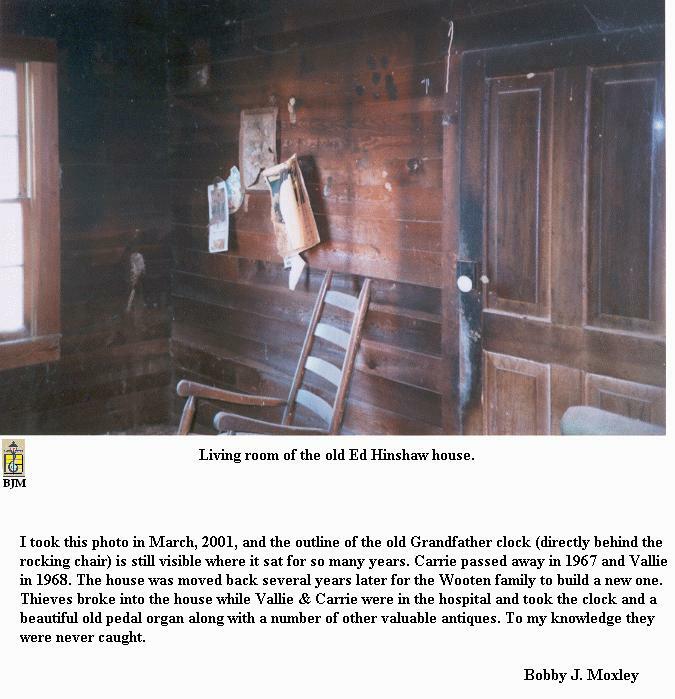 1900 census, Boonville Township, Yadkin County, North Carolina; roll T623-1225, ED 133, page 15B, line #61, dwelling #280, family #282. 1910 census, Boonville Township, Yadkin County, North Carolina; roll T624-1130, ED 136, page 130A, line #35, dwelling #294, family #297. 1920 census, Boonville Township, Yadkin County, North Carolina; roll T625-1324, ED 192, page 6B, line #65, dwelling #98. 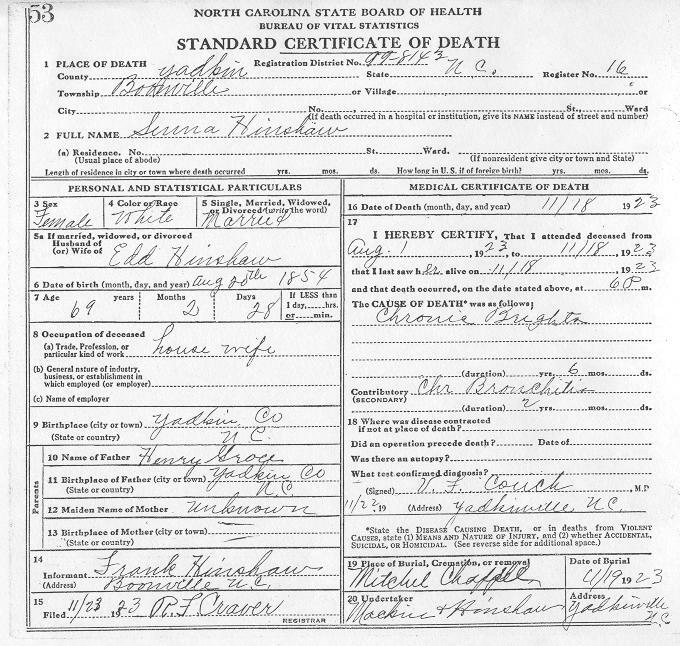 Death certificate of Hesseany Isabel Groce Hinshaw; contributed by Bob J. Moxley (). 1910 census, Boonville Township, Yadkin County, North Carolina; roll T624-1130, ED 136, page 130A, line #25, dwelling #293, family #296. Photo courtesy of Bill Hinshaw.